And she couldn't be happier about it. 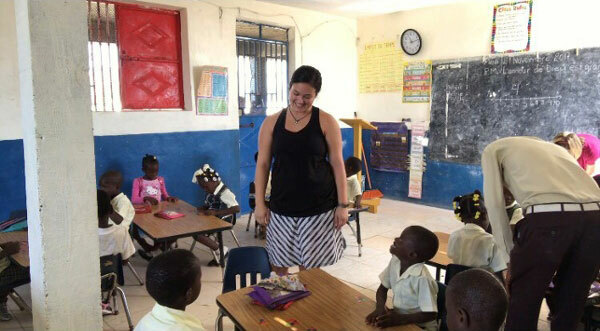 Because Sumner and Pittman have teaching backgrounds, one of the friends who lives in Haiti emailed a school principal he knows and asked if the women could visit the students. They ended up spending a week at the school teaching specific classroom lessons each day to pre-school children through sixth-graders. "We had no knowledge as to where any of these students were in their learning," said Sumner, a 22-year-old senior from Cochran. "We made our best guess as to what we thought each grade should know, and that’s what we prepared." The Haitian children's English fluency ranged from none to fair, so a translator helped Sumner and Pittman each day. They helped the preschoolers with their number counting skills, then moved on to the upper grades. "In first grade we prepared to teach the concept of greater than, less than. The students had already learned that, so we had to adjust the lesson and basically wing it. We decided to incorporate a different strategy to show the students another way. I would write a number line on the board, and the students would have to give me a number. For example: two less than four. The student would then have to count on the number line and circle the number that was two less than four. "In the second grade, we taught fact families. We provided each student with a ten frame and ten counter chips. We would then ask them to make as many ways that added up to ten using two different colored chips. This was probably one of my favorite lessons, because the students got so into it, and they only had to say numbers, which I understood in creole. The students gave us as many ways they could think of to add up to ten, and then we made them give us as many ways as they could to subtract using those same numbers. It was tricky at first, but once the students caught on, they were yelling and getting out of their seats trying to say the answer before their other classmates! "In third grade we introduced multiplication with arrays. The students had to construct their own garden. We gave them a certain number of crops they could plant. In their garden they had to use equal arrays. This exercise touched on critical-thinking skills because the students had to implement multiplication to figure out how many rows and columns they would need to make it equal. "In fourth grade we introduced perimeter. We required the students to construct their own markets using graphing paper. Each square counted as one square inch. The students loved this. It incorporated critical-thinking skills because they had to fit in all of the different types of market stands, such as those selling fish, meat, and avocados. We made sure to use things they were accustomed to eating in Haiti. It was a great example of how when you travel abroad to teach you have to study the culture to be able to relate to your students. "In fifth grade we introduced a coordinate plane. We only taught quadrant one. We made a life- size graph on the floor. Each student drew an ordered pair out of a cup, and they had to plot themselves on the life-size graph. They loved this. We repeated about four times because the students loved how hands-on it was. They are so used to pencil and paper activities that they said, 'This doesn’t even feel like class.' I knew at that moment that we had succeeded at introducing hands-on activities to the children. "In sixth grade we introduced coordinate plane as well, but we did all four quadrants. We drew a huge coordinate plane on the board, and allowed each student to come up to plot the points. Even the teacher was engaged." Sumner and Pittman also led a seminar for the school's teachers on classroom management and tips for hands-on teaching in science classes. On her last day at the school, Sumner gave English lessons to the older students. "That was super fun, especially considering I plan to travel to China next year to teach English for an entire year." See Middle Georgia State University's Facebook page for more photos of Sumner and Pittman at the Haitian school.